Like most of you, I was first made aware of the military operation that brought down Bin Laden through traditional news dissemination models. Namely, my wife was on Facebook and saw a status update from someone she went to high school with declaring the Al Qaeda leader was dead so we turned on the actual news to confirm. I found this ironic for several reasons, not the least of which was that the song had been removed from many radio station playlists after 9/11 because it was feared to be insensitive by Clear Channel. Other titles deemed inappropriate for post 9/11 airplay by Clear Channel included “Bad Day” by Fuel, “Free Fallin” by Tom Petty, “You Dropped a Bomb on Me” by The Gap Band, and any song that Rage Against The Machine had ever recorded…..ever. Musical selections aside, the reaction of the crowd caught me off-guard. 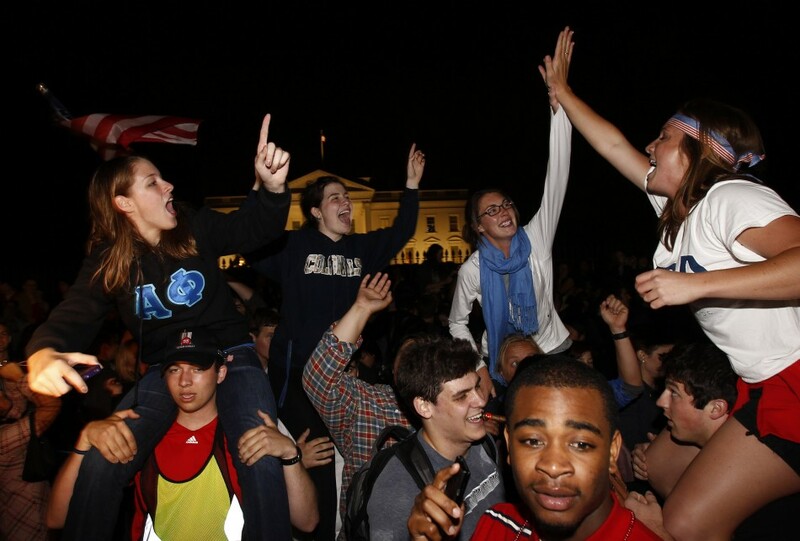 Frat guys were cracking open beers and young girls were shoulder surfing and high-fiving each other with such unbridled enthusiasm that for a moment I suspected that CNN was showing archive footage from a late 90’s Limp Bizkit concert. Rock-fingers and cabbage-patching became ubiquitous as the crowd continued to grow and I could not help but wonder if this was the correct reaction to the president’s announcement. Do not misunderstand me; I truly believe that the world is a better place without Osama in it and I applaud the tireless effort and sacrifice it took to bring such a moment to fruition, but I became concerned that a few of the revelers might have been one set of plastic beads away from removing their tops. Personally, I found the moment to be rather somber and poignant. This one man had set into motion a chain of events that would culminate in the worst act of terrorism in the history of our nation. This attack would then directly lead to a massive manhunt and our occupation of two separate foreign countries only to discover that the object of our search resided in neither. We have now added 1.2 Trillion to our nation’s debt, and infinitely more important, we have sacrificed 6,000 soldiers brave enough to bet their very lives on the causes we believe to be just. Ideally, the news of Bin Laden’s death would immediately usher in an era of complete stability in the security infrastructure of Iraq and Afghanistan. Our troops would all come home and the pain felt by all of those affected by Osama’s actions would abate. Organized terrorism would collapse and our way of life would revert back to the relative blissful ignorance we enjoyed before the twin towers fell. But we all knew that was not going to happen because history has taught us that the reverberations of a human life (whether righteous or unrighteous) cannot be neutralized by their death. All of this put into motion because a tall, bearded Saudi Arabian was able to convince a sizable number of people that God required unspeakable violence be done on His behalf. When the name of God is no longer invoked to spill the blood of the innocent, proliferate hatred, or justify personal vendettas. When all of our troops have returned safely home to witness their child’s first steps and embrace their loved ones, then I will be the first one celebrating in the streets of our capital; but until that day you will just have to forgive me for keeping my top on. It seems everyone is "taking a victory lap". When Hilter's body was found it was news for only a short time but it was overshadowed by the fact that the Second World War was over.